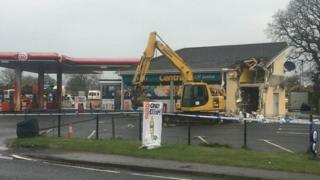 Thieves have used a digger to steal a cash machine from a shop in County Londonderry. The incident at a shop outside Dungiven happened at about 04:30 BST on Sunday. According to the garage owners, CCTV revealed the raid, carried out by men in balaclavas, lasted just over four minutes. It is the latest in a series of ATM thefts on both sides of the Irish border, with the PSNI saying it was the eighth such incident in 2019. The digger was stolen from a building site further down the road before being driven to the garage. The owner of the garage said the CCTV footage showed thieves lowering the cash machine into a Citroen Berlingo car which had its roof cut off and driving away, with the machine protruding out of the top of the vehicle. Last week, there were two separate incidents of cash machine thefts - one outside a shop in County Antrim and the the wall of a bank in County Monaghan in the Irish Republic. Police warned there could be several gangs involved in the theft of cash machines in Northern Ireland. Shop owner Martin O'Kane said: "There are going to be less and less ATMs about now because of these attacks. There is one basically happening every week now. "I probably won't get another cash machine in again, and that will be the local community losing out." Police have appealed for anyone with information on the Dungiven incident to come forward. Det Insp Richard Thornton said a digger taken from a site close to the shop had been used to rip the machine from the wall. "On this occasion, the digger was not set alight and was located at the scene." He added: "As in all of these ATM thefts, the actions of these criminals have not only caused immediate financial harm to the business targeted, but they have understandably caused fear in the community and impacted upon a vital service many local people rely on," he said. "We are doing all we can to catch the people responsible - it is a key priority for us - however, I want to reiterate that the key to stopping these crimes and getting ahead of these criminals is information from the public. In March, the PSNI announced the creation of a new team of detectives to investigate cash machine thefts, following an upsurge in the number of built-in cash machines being ripped from the walls of commercial properties by plant machinery. One customer at the garage on Sunday told BBC News NI the theft of the cash machine was a big loss, especially following closures of banks in the area.